In the summer of 1909, the Royal Navy faced increasing pressure to increase its fleet of modern dreadnought battleships and battle cruisers while maintaining its commitments around the globe. To help meet this and spread the costs, the British government proposed that Australia, New Zealand, South Africa and Canada each fund and man a squadron of one new armored cruiser, three light cruisers and six destroyers. Of the four, only Australia took up the full proposal. One armored cruiser and three smaller cruisers would be ordered immediately, for construction in British shipyards. The Australian government would pay for their construction and upkeep, and they would be manned by Australian personnel. During wartime, they would be at the disposal of the British Admiralty. New Zealand could not meet the same level of commitment, but did agree to fund a new armored cruiser and present it to the Royal Navy. South Africa and Canada rejected the proposal outright. Pride of the Australian Navy, from a 1914 postcard. At the time of the conference, Britain's most recent armored cruiser, Defence, had been commissioned in February — after a considerable delay as resources went instead to the new battle cruisers of the Invincible class. The third battle cruiser completed in March 1909, and one more, Indefatigable, had been laid down in February to a slightly improved design. Events were moving quickly when the two Dominions made their offers. The Admiralty intended to order two capital ships under the 1908 program, the battleship Neptune and the battle cruiser Indefatigable. 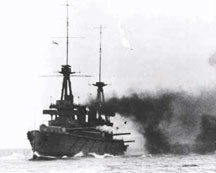 The 1909 program initially was to also include two battleships, near-sisters of Neptune, and the two battle cruisers provided by New Zealand and Australia. Rumors of increases in the German building program sparked public pressure for eight new ships rather than four (or two, depending on who was doing the counting). Six additional ships were added to the 1909 program: four "super dreadnoughts" of the Orion class, and two battle cruiser equivalents, Lion and Princess Royal. Although Lion was laid down nine months before Australia and New Zealand, the two Dominion ships repeated the inferior Indefatigable design as originally ordered. Lion was a far more capable ship, almost half again as large with much greater firepower. Not willing to lose the commitments, the Admiralty did not press the Dominions to switch to the more expensive Lion (£2.1 million as opposed to £1.7 million for the smaller battle cruiser), even though the Dominions had budgeted two million each for the cruisers. This failure left Royal Navy with far less capable ships when war erupted five years later. Australia conducts experiments with a Sopwith 1 1/2 Strutter, 1918. Australia completed in June 1913, and sailed for her homeland the next month, stopping at Capetown for a visit carefully calculated to show the Union's leadership what they were missing. She served as flagship of the new Royal Australian Navy for less than a year before war broke out and she took on a major role in its early weeks. Maximilian Reichsgraf von Spee's German East Asia Squadron was on the loose in the Pacific, and Australia was faster than any of his ships and capable of blowing all of them out of the water. At 18,500 tons, Australia was bigger than either of Spee's 12,800-ton armored cruisers. She could make almost 27 knots, a considerable edge in speed, and her eight 12-inch guns gave her greater firepower than any ship in the Pacific except the newest Japanese battleships. Rather than deploy the big cruiser to hunt down and eliminate the threat posed by Spee to Allied commerce and military convoys, the Admiralty kept Australia tied to the invasions of German New Guinea and Samoa. Not until Spee wiped out Sir Christopher Cradock's cruiser squadron was Australia ordered to pursue, heading for South America on 1 November. She was still on her way when two British battle cruisers annihilated Spee's ships, and suffered grounding damage in the Straits of Magellan on New Year's Day. She also sank a German supply ship along the way. Australia fires a broadside, but only as a training exercise. Australia arrived in England on 28 January 1915, four days after the Battle of Dogger Bank, and in early February she re-deployed to Rosyth, Scotland as flagship of the Second Battle Cruiser Squadron. She participated in numerous Grand Fleet operations, and on 22 April 1916 rammed her sister New Zealand during heavy fog. She spent the next six weeks under repair, missing the Battle of Jutland. Australia served as squadron flagship for the rest of the war and led one of the two long columns of Allied warships that accepted the surrender of the German High Seas Fleet in November 1918, but Australia had never fired her guns in anger. She returned home the following spring, arriving in Freemantle in May 1919. A few days later, part of the crew mutinied when ordered to sail for Sydney — they had not had their fill of the joys of Perth. Five crewmen were sentenced to prison terms, but all were released by the end of the year. The big cruiser conducted training cruises but soon grew too expensive for the peacetime budget and she went into reserve at the end of 1921. The following year, she was sacrificed at the Washington naval limitations talks, designated for destruction to end the economically-crippling world naval arms race. This is the end. Australia sinks off Inner South Head, 12 April 1924. Towed off Inner South Head near Sydney, the battle cruiser was scuttled in April 1924. "In her passing she symbolizes our contribution to the cause of peace," Prime Minister Stanley Bruce noted. "We shall never forget that in the eventful days of 1914, when the fate of civilization hung in the balance, it was the presence in the Pacific of the Australia, manned by Australian seamen, that saved our shores and our shipping from the fate which overtook less fortunate nations." 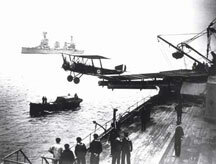 Australia's sacrifice had not been popular within the Royal Australian Navy, with some officers arguing that she should not be counted against the British force total. 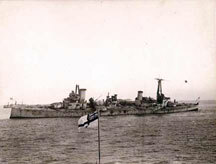 The RAN compensated for her loss with two new County-class heavy cruisers, but many with the small corps of Australian naval officers never fully accepted the destruction of the ship when she remained in excellent condition, having taken no battle damage. For a ship that never saw combat, Australia appears in several of our Great War at Sea series games, making her presence felt in Jutland and most notably in Cruiser Warfare. Click here to order Cruiser Warfare right now. 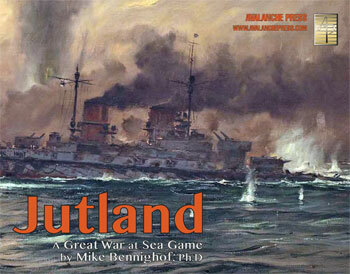 Click here to order Great War at Sea: Jutland right now.